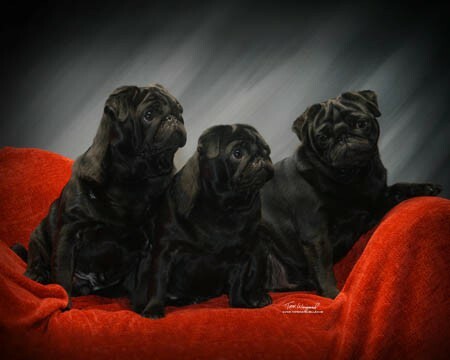 ​PUG COLOR- A MATTER OF PREFERENCE AND GENETICS by Christine Dresser, DVM Click on the title to read. Many people are interested in finding colors of pugs that may be considered “different”, “rare” or “trendy”. The Pug Dog Club of America wants to be sure that people truly interested in the breed will do their best to ensure pugs are within the “standard” of the breed. Support past and present purebred breeders in keeping our breed healthy and true to the standards of the breed. FACT: A purebred pug comes in two colors only – fawn and black. These colors are the registered standard colors of the breed. All reputable breeders of pugs know this and are not interested in the development of any color of pug other than fawn or black. COLOR: The colors are fawn or black. The fawn color should be decided so as to make the contrast complete between the color and … mask. MARKINGS: The markings are clearly defined. The muzzle or mask, ears … should be as black as possible. The PDCA does not support the development of trendy colors of the pug. If you are interested in learning more about the AKC/PCDA breed standard colors, please read “Color and Markings” in the Pug Standard.